Ned Rozell | Geophysical Institute Apr 27, 2018. Millions of Alaska birds nest on rocky emerald islands seen by few people other than ship captains. One of the funkiest of these creatures is the crested auklet, which looks like a bassist in a punk band and smells like a tangerine. These hand-size birds have intrigued Hector Douglas for years. He just wrote a paper on how the smelliest crested auklets also have the largest crests — groups of feathers sprouting from their heads that resemble backward ponytails. The birds have neon-orange beaks and white eyes dotted with pupils that look like the period at the end of this sentence. 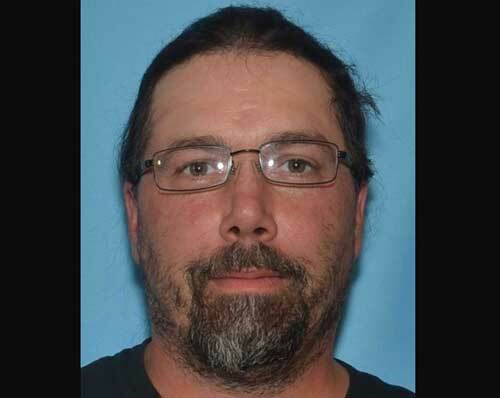 Douglas was a graduate student with UAF’s Institute of Marine Science when he sailed on a fishing boat to Big Koniuji Island southeast of Sand Point, Alaska, 16 years ago. The island, named by the Aleut for the “big-crested auk,” was one of the great gathering sites of crested auklets on Earth in the years before the Russians started fox farming in the Aleutians. 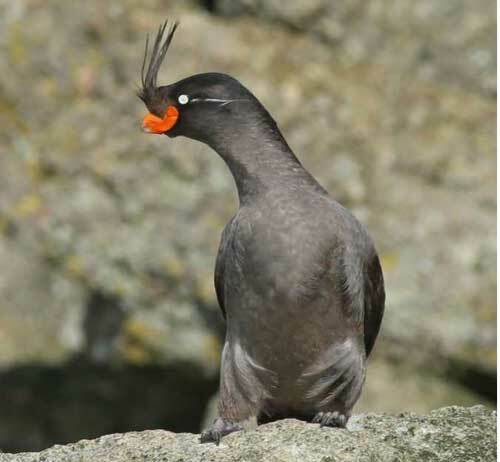 Now free of foxes, Big Koniuji still hosts thousands of auklets in the midsummer breeding season. Motoring to the island through the mist, Douglas remembers smelling oranges at the same time auklets swirled overhead in great flocks. He went there and to other islands to study the birds because he had a question: Why do they smell like that? Not many birds are known for being odiferous. Because foxes, squirrels and other nest predators have great noses, wafting off intriguing scents would seem to be a bad idea. But Douglas and others have found that crested auklets emit octanal, a compound also found in tangerines. Crested auklets entwine their necks and rub their bills through each other’s plumage when courting, possibly sniffing up a potential mate. Not long ago, longtime bird researchers downplayed birds’ sense of smell, but the more scientists have looked at different species, the more they are finding. The New Zealand parrot the kakapo not only emits the scent of lavender, but researchers found it has more than 600 olfactory receptor genes, compared to about 400 similar genes in humans. I once watched a turkey vulture swoop down to a basketball court and shuffle over to a spruce tree, beneath which I placed a dead sparrow the night before. The vulture seemed to have sniffed out a few sulfurous molecules from hundreds of feet overhead. Douglas, who was an assistant biology professor at UAF’s campus in Bethel until his position was cut, has written 10 papers relating in some way to the scent of crested auklets.